The catalogue continues the scientific treatment of the so-called basic series of the collection of fragments in the National Museum Library in Prague. It contains descriptions of seven shelf-mark sections, each of which is complemented by an introduction with more detailed characteristics of the collection. Shelf marks 1 D a and 1 E c comprise mostly medieval Latin-language fragments; their catalogues have been created by Mgr. Jindřich Marek, Ph.D., and Mgr. Adéla Ebersonová. 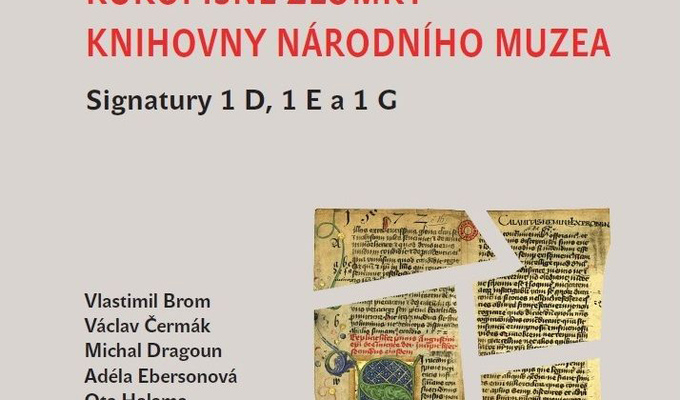 The section 1 D b mainly consists of modern Czech-language fragments; its catalogue has been prepared by Mgr. Dmitry Timofeyev. The specific shelf mark 1 D c, which is one of the few that have remained homogeneous and contains fragments written in the Glagolitic and Cyrillic scripts, has been described by Mgr. Václav Čermák, Ph.D., and Mgr. Kateřina Spurná. The section 1 E a, established for medieval German fragments, has been covered by Mgr. Vlastimil Brom, Ph.D. Shelf mark 1 E b comprises especially completely preserved manuscripts of a small extent associated with the activities of the Unity of Brethren and Polish Protestants, which, strictly speaking, do not correspond to the definition of a fragment. The description of these sources has been prepared by Mgr. Ota Halama, Th.D. Shelf mark 1 G includes mainly documents of less usual form or (in the context of the Czech collection) language. a doc. Tamás Visi, Ph.D., M.A. Its major part comprises Hebrew fragments, covered by Mgr. Olga Sixtová and doc. Tamás Visi, Ph.D., M.A. The rest of shelf mark 1 G has been described by Mgr. Michal Dragoun, who has also prepared the indices.